Your beautifully taken photos help to capture what life is really like in different countries. The world needs to be more aware. Fantastic photo. You have nice shots capturing lives of people – great collection! 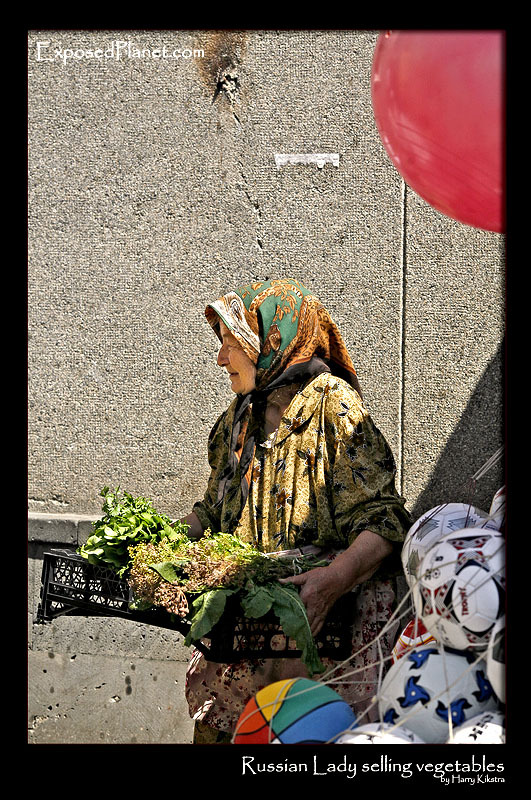 The story behind "Russian lady selling vegetables on the market"
Southern Russia is quite poor, even compared with the rest of the country. The markets are now flooded with cheap plastic stuff like these balls, but in between are the Babushka’s that sell the product of the land as they have done all their lives. The buildings are generally neglected since the downfall of communism, as they were maintained by the hordes of people that got a job through the government. Nowadays Russia has a high unemployment rate like any other developing capitalist nation and outside the main tourist centers like central Moscow, the walls are full of old paint, and the walls are cracked.